· ✔ TRESS SENSOR: The RC quadcopter sensor with height keeps at the press of a button on the remote control automatically the height. This funkion is precisely for beginners useful, to create photos with the HD camera. 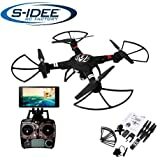 · ✔ HD Camera: The RC Drone with HD Camera resolves photos and videos using a button on the remote control of the video. have a resolution of 1280 x 720 pixels at 30 fps. The photos and videos can also be transferred directly to a memory card stored and then on the PC. · ✔ High load possible: the quadcopter allows a large load capacity in the situation. he is an action camera (GoPro for example) to lift up. So arise even eindrucksvollere recordings during your flight.